On January 3, 1971, I watched the 49ers play their last game ever at Kezar Stadium, losing to the Dallas Cowboys for the right to play in Super Bowl V. Prior to that game, I had bought a bottle of champagne planning to drink it in the stands in toast to the 49ers victory and the memory of all the games my dad had taken me to at Kezar. Tonight, I finally drank the bottle. 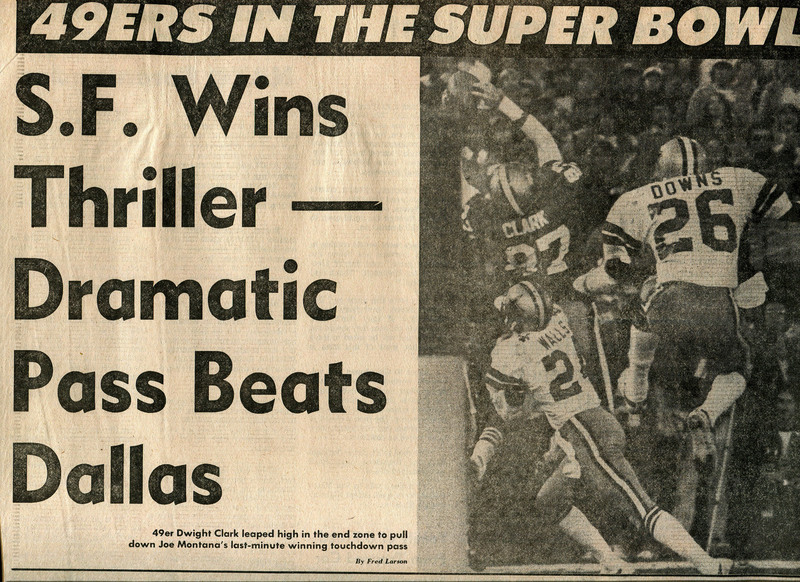 We beat the Cowboys today at Candlestick Park in the most incredible game in 49er history coming back to win 28-27 — and it’s now on to the Super Bowl for the first time. I got to watch the game from the field as I was working security on the Dallas side. The noise was unbelievable. We were losing with a couple minutes to play as Joe Montana drove them up the field. We had to face the crowd and they were going nuts. Which was good. Worrying about the crowd running on the field kept my emotions in check. After all these years of heartbreak — going all the way back to the playoff loss in 1957, which I saw with my Dad. I didn’t know if I could handle the 49ers losing again. So the 49ers had a third and goal from the six with a minute to play. Montana rolled out and threw the old “Alley Oop” to Dwight Clark who leaped up and grabbed it for the winning TD — the way RC Owens used to do it. I was behind the Dallas bench, but I snuck a peak as the play started and saw Clark go up for it; then he disappeared from view and the crowded exploded. I had tears rolling down my eyes, but so did everyone else in the stands. Fortunately nobody tried to jump out onto the field in front of me as they were only tied. But the extra point put them ahead with 50 seconds to go. She took that advice to her death. Too bad she couldn’t have lived to see this afternoon. The Cowboys were driving for the winning field goal … and they fumbled. And we recovered. . . . SUPER BOWL!!!!!!!!!!!!!!! Unfucking believable! We finally made it! The fans stormed the field. But there was nothing we could do about it and WHY!!!!! I wanted to tear up the grass with them. When we finally got out of there about 1930 , I picked up a piece of Candlestick Park grass and I have it over the fireplace in a glass. It’s hard to believe the 49ers will actually be in the Super Bowl. It’s been six hours since the end of the game, and I still can’t believe it.So now it’s onto to Detroit and Cincinnati who beat San Diego in -59 degree weather. Sunday January 10, 1982 will long be remembered. This entry was posted in Sports and tagged "The Catch" Joe Montana, 1981 NFC Championship, Dallas Cowboys, Dwight Clark, San Francisco 49ers by Bill Fox. Bookmark the permalink.